Once the integration is finished, we highly recommend you test the setup. You will find out how to test your setup in this section. Then, you can start tagging events and saving attributes in your app. The best way to install the SDK is with CocoaPods. This will allow you to easily update the SDK when new versions are released. If you have not installed CocoaPods yet, you may refer to the this site, where you can install Cocoapods (1.1.0 or later). Before you start, be sure to have a Podfile. You could create one by writing pod init in your terminal in your project. To open your Podfile, you could find it in your Workspace, or by writing open -a Xcode Podfile in the terminal. Run pod repo update from the command line. This will enable CocoaPods to detect the latest available version of FollowAnalytics. Now FollowAnalytics is successfully installed. To open your project with Xcode, use the .xcworkspace file generated by CocoaPods. Be sure to have your API key for this step of the configuration. You can retrieve you app's API key from the administration section of the FollowAnalytics platform. 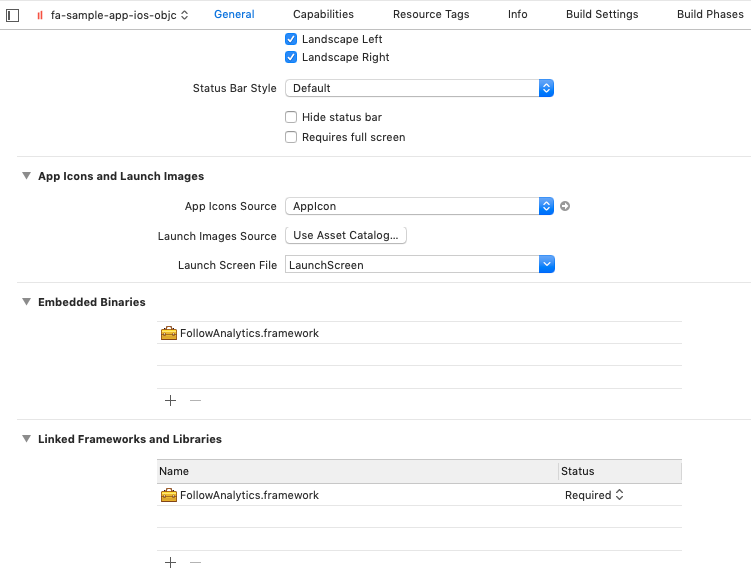 Import the FollowAnalytics framework in your AppDelegate. c.apiKey = "YOUR API KEY"
You can configure the SDK with all the available parameters which you can find here. The FollowAnalytics SDK proxies the application's delegate. If you are changing the default app delegate, make sure to do so before initializing the FollowAnalytics SDK. Your application may behave erratically if you don't. Other SDKs, like Firebase, may swizzle your applications' methods by default. In order to have both FollowAnalytics and Firebase SDK working properly in your app, make sure you set the FirebaseAppDelegateProxyEnabled to NO in you app's Info.plist. Enable Push Notifications by setting the switch to ON. This will ensure that FollowAnalytics can detect uninstalls and send Silent Push Notifications. In order to display notifications on the screen of your app, the operating system requires a permission from the user. Enable this by calling the requestNotificationCenterDefaultAuthorisation method. Without this request, notifications will be sent to the app as a silent notification. FollowAnalytics will only access the location if you give the permission to the SDK. If you are already using it and want to share it with FollowAnalytics you will have to call : enableGeofencing. Go to the info tab of the project targets. At the bottom you select the subsection called "URL Types". Click the + sign at the bottom. Once configured, your FollowAnalytics device ID can be obtained by opening the following URI: YourURLScheme://followanalytics.com/deviceId, with YourURLScheme as the application bundle ID. Now, users can add devices to the platform by registering without needing to know the device ID. From the platform, they will send an email a link that will open the app and allow them to register the device. We highly recommend you test your setup before you start adding analytics and campaign features to your app. These steps will help you understand how the SDK works and provide you with ways to better use the FollowAnalytics SDK. Now that you have the SDK installed and the requirements fulfilled, you can test your setup with the tools we provide. The SDK has a Validator that will ensure that everything is properly configured. When your app is running in debug mode, a popup is shown at launch time with the details of what is properly configured, and what is not. This makes it easier for you to validate that the various steps were performed properly. To know more about what the validator checks and how, please refer to its dedicated page. You can test your push notifications by using the Device Observer. You can access the Device Observer by going to Administration > Test Devices and click on your device. There you will find live logs coming from the SDK and send a default push notification. Your device must be registered in order to use the observer. You can register devices from the "Test Devices" page. You can find more on the Device Observer here. To simulate a crash of your device, you can create an empty array and try to access its item at index 0. This will crash your device. When reloading the app, you will see a Crash report sent to FollowAnalytics servers. To verify that the crash configuration is working properly, launch your app without the debugger. i.e. manually on the device or from the simulator, without using the "run" button in Xcode. When your app runs in DEBUG mode or in a simulator, the data is automatically sent as development logs, and is therefore not processed to be shown on the main UI page. DEBUG logs can be checked using the method given in the FAQ section (see related entry in FAQ for more information on debug & release modes). To successfully empower your team with FollowAnalytics make sure your logs are relevant, please read the Logging best practices entry in the FAQ section. Use the name as the unique identifier of your log. Use the details section to add specific details or context. The details field can either be a String or a Hash, so that you can associate multiple key-values for additional context. In debug mode, the SDK will acknowledge the saving by writing in the console whatever it receives. If the parameters sent to these methods are over 60Kb, the method will refuse them, return NO, and write a message in the console if it is running in debug mode. // Setup: Adopt WKUIDelegate protocol in your object of choice, typically a UIViewController. // The rest of the steps assume that you are in a UIViewController context. // Set up your configuration as needed. Attributes are tied to the device when no user ID is provided. If a user ID is set, a profile is created server-side and can be shared across apps. open class func getUserId() -> String? The SDK allows to set values for both custom and predefined attributes. The FollowAnalyticsUserAttributes is implemented by FollowAnalytics.userAttributes so you can use it. They are "predefined" in the sense that they will be attached to default fields on your user profiles. [FollowAnalytics.userAttributes remove:@"lemon" toSet:@"fruits"]; // Removes "lemon" from set of fruits. [FollowAnalytics.userAttributes clearSet:@"fruits"]; // Removes all the items from the set. Please see additional doc in the new FollowAnalytics and FollowAnalyticsConfiguration interface for more details. Additionally, if the opt-in by default policy doesn't suit your use case you can change it by setting the optInAnalyticsDefault on FollowAnalyticsConfiguration. The SDK will record all requests and send them to FollowAnalytics servers as soon as network conditions allow it. The SDK remembers pending requests between app restarts. What we mean by campaigns are the messages that you with to send to your user from the FollowAnalytics platform. Currently, FollowAnalytics enables you to send two types of campaigns: push notifications and in-app messages. Push notifications allow you to send messages to your user's home screen, whereas an in-app a message that is displayed in the app while the user is actively using it. Before you start, be sure that the SDK is properly initialized. This includes registration for push notifications, which is covered in the integration section. In this section, we cover all you need for your app to receive the campaigns sent from the FollowAnalytics platform, and how you can add the features the fully take of advantage the SDK's capabilities. Rich push notifications are notifications with embedded rich media (images, GIFs, videos). They are only available on iOS 10 and above. Should a user have a version under iOS 10, they will receive rich push notifications but not be able to see the rich media included. In your xCode project, add a new target. Select Notification Service Extension, give it a name and confirm. Then when prompted, activate the scheme. If you don't have a podfile yet, open a console and do a pod init in your project directory. Press the + button, and select New Copy File Phase. Add the FANotificationExtension.framework, you should find it inside the Pod folder. Press the + button, and select New Run Script Phase. Copy and paste the code underneath. // original push payload will be used. Badges are small red indicators displayed at the top right-hand corner of the app icon. FollowAnalytics enables you to use badges, so that every time you send a push notification, appears or the value of the badge is incremented. Once enabled, badges are added by turning on the 'badge' switch at the creation of the campaign from the FollowAnalytics platform. Create an app group between your app and the extension. Create an App Groups between your main App and you extension. Enable app group capability in the App IDs of your main application and your notification service extension. The app group should be the same in main application and notification service extension. Activate the app group capability in XCode project configuration, and add the corresponding app group bundle. Re-download all the provisioning profiles for application and notification service extension. Campaigns created through FollowAnalytics allow to deep link to content in an app. This could be for your app or a third party. For this you can use specific deep-linking features you will find explained here. Version 4.1.0 of the SDK introduced the possibility to use direct App Links like twitter://messages, which will send you to the corresponding screen inside the Twitter app. You can use this feature by adding the deep-link in the "Advanced Options" the FollowAnalytics platform, when creating a campaign. In the case of an external application you'll be presented with a system alert asking you to allow the redirection for the target application (the first time only). If the App Link is a deep link to your app, you can set the onOpenURL callback on the configuration, in order for you to be able to chose when your app is ready to execute the App links. If you chose to do so, make sure to eventually call the given callback or else the URL opening will not happen. In FollowAnalytics campaigns, you can specify deep-linking parameters, e.g. in your push messages or for in-app button actions. These parameters are given to the developer's code by the SDK. It is then up to the developer to implement the deep-linking in the app (specific path of screens, format of the arguments, etc.). In order to access the deep-link parameters, implement the onIncomingDeepLink callback on FollowAnalyticsConfiguration. Regular deep-linking is usually implemented using a Router that will handle the URL called in the app. The router will translate it into the display of the right page, with the right content. An example of an open-source deep-linking router is DeepLinkKit. let url:NSURL = NSURL(string: customParameters["deeplinking-path"] as! String)! FollowAnalytics SDK enables you to integrate features to your push notifications that allows the user to use the notification without needing to access the app (this could be used add share on social media or feedback). These are called interactive notifications. Previously, to ensure your interactive notification categories were properly set, you had to write your category definition code inside the followAppsRegisterNotificationCategories delegate method, so that the SDK can trigger this registration when needed. From 6.0 on, given that notification registration and notification display authorization are two different processes, FollowAnalytics handles only the notification registration. 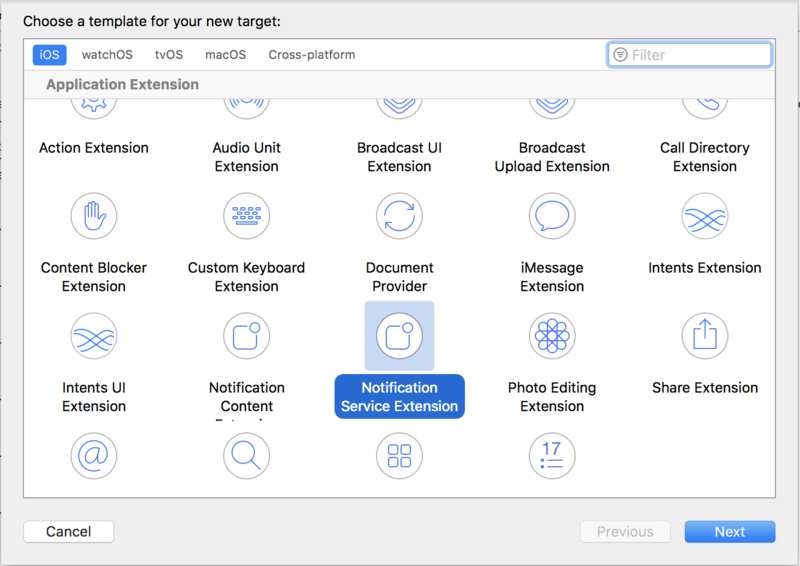 Is your responsibility to request proper notification center authorization including notification categories. For those who don't need interactive notification and don't want to handle authorization we do provide a method requestNotificationCenterDefaultAuthorisation that can be called on FollowAnalytics class. Once set up the categories can be used when creating a FollowAnalytics push campaign. If a user receives an interactive notification sent from FollowAnalytics, and taps one of the buttons, the SDK calls the onIncomingCustomCampaign handler, if defined on FollowAnalyticsConfiguration object before startup, and passes the action identifier and title. If no custom parameter were defined when creating the campaign, the first parameter is an empty dictionary. Rich Campaigns can be handled directly by the app code. If you do not want the code to handle the message automatically, and would rather show the message yourself when you see fit, you can turn on the switch labelled "automatically display content" in the Advanced Options when creating the campaign. For campaigns where the content is not handled by FollowAnalytics, set your handler to onIncomingCustomCampaign on the FAFollowAnalyticsConfiguration before the SDK startup. Pausing campaigns are used to prevent in-app from being displayed on certain screens and views of your app. You may pause a screen of the app when it is too important, or is part of a process that is too important to be interrupted by an in-app (i.e a payment screen in the process of the user making a purchase). When the screen is safe to display an in-app, you resume in-app campaigns. Any campaign supposed to be displayed when the mechanism is paused, is stacked and shown as soon as the mechanism is resumed. This way you can send send in-app campaigns without impacting the user experience. Rather than pause everywhere you have an important screen or process, you can pause right at the initialization of the SDK and resume in the areas you think it is safe for in-app campaigns to be displayed. ⚠️ If you use this feature (storeMessages), we won't delete any message. Your Data Wallet puts together what is called a policy. This policy which is created from the FollowAnalytics platform, is what brings together the legal texts, data categories, recipients and purposes you have determined in your Data Wallet. There could only be one policy at a time. Every time it is updated on the platform, the policy downloaded by the SDK. If you want to use Data Wallet, the very first step is to enable it in your app at startup. This is done by accessing the FollowAnalyticsConfiguration object which contains the property isDataWalletEnabled. Set this property to true. If FollowAnalytics.dataWallet.isRead is false, the current policy major version has yet to be accepted by the user. If the current policy is accepted, FollowAnalytics.dataWallet.isRead becomes true. The SDK records the major version of the current policy for future reference. By default, if no other configuration is present, the SDK will return a default policy with version 0.0. This policy is always read. You should check for version 0.0 and handle it appropriately. Before initializing the SDK you must enable the different functions of the SDK. Even though you can install the SDK manually, cocoapods is the preferred method, since it will take care of much of the work and ensure your SDK is easily updated. Go to your Xcode project’s General settings of your target, drag and drop the FollowAnalytics.framework in the Embedded Binaries section. Make sure Copy items if needed is selected and click Finish. This step is required to work around an App Store submission bug when archiving universal binaries. Now, you can proceed to configuring and validating your setup. Drag and drop the framework in your project and add it to your extension target. Apple introduced App Transport Security (ATS) in iOS 9 to improve user security and privacy by requiring apps to use secure network connections over HTTPS. At WWDC 2016 they announced that apps submitted to the App Store will be required to support ATS at the end of the year. To give you additional time to prepare, this deadline was extended. Apple has yet to announce the new date. Learn more about it here. While this security policy is not enforced you can load unsafe urls by adding the following exception to your .plist. When creating campaigns in FollowAnalytics, you will be able to use URLs for message contents or actions. We recommend using HTTPS, but if you cannot, you will need to add this exception in your .plist file. For manual integration, do not forward anymore delegate methods to FollowAnalytics. We automatically intercept the invocations when needed. Previous versions of opt-out via settings bundle are deprecated and completely removed starting with version 6 of the SDK. While still available, a warning shall be sent to log about the deprecated use. The new 5.4 opt-out feature must be used for RGPD compliance. If you used the badge management, you have to specify your appGroup shared between the app and the notification service extension. PassKit is not required anymore. If you don't use it you can remove it. + (BOOL)removeCustomUserAttribute:(NSString *)attribute fromSetWithKey:(NSString *)key //Remove one element from the specify set. The migration is seamless. However, please refer to the section around user attributes to learn how to feed user profiles using the SDK. Link an additional Framework in the Settings of your targets: libsqlite3.dylib. These new parameters are provided only when running on iOS 8 and later. They are the interactive notification parameters that you would want to get to know which action was performed on a FollowAnalytics notification. Nothing else changes. Please refer to the rest of the documentation to discover what the newer versions of the SDK now allow.